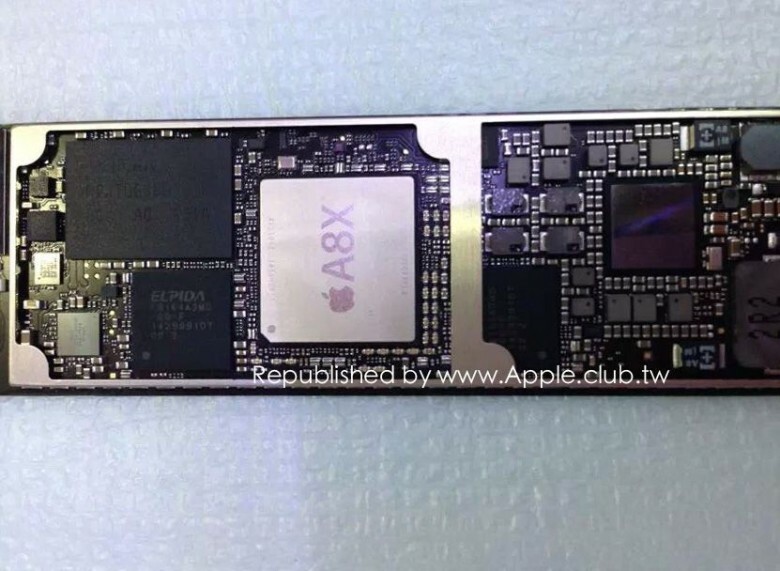 The full details of Apple’s second-generation iPad Air will be revealed in just four short days, but Apple.Club.tw has published a photo of an alleged iPad Air 2 logic board that reveals Cupertino has a souped up A8X chip ready for the new tablet. If the logic board is genuine, it confirms rumors that Apple will improve the Air’s performance with a special A-chip variant, like the A5X and A6X processors used in previous iPads. The logic board also appears to contain 2GB of RAM, though the chip numbers are a bit hard to read. The characters on the Elpida chip are blurry, but it looks like the second character – used to indicate the amount of RAM – is an ‘A’, which stands for 2GB, while an ‘8’ would be used to represent 1GB. Apple is hosting a town hall press event at its Cupertino campus on Thursday, October 16th at 10AM PT. Invites to the ‘It’s Been Way Too Long’ event didn’t leave any clues as to what Apple plans to reveal, but it’s expected to announce new iPads and a Retina iMac to go with the public release of OS X Yosemite. Other new iPad Air 2 features may include an anti-reflective coating, slimmer design, Touch ID, Apple Pay, recessed volume buttons, refined speaker grills, and a gold color options.